The imaging on Whole Foods's cartons shows green pastures. 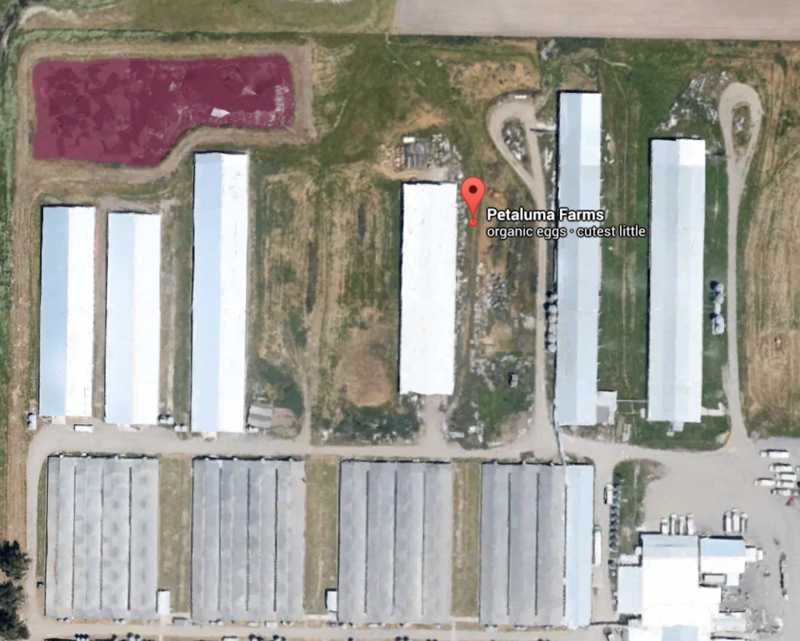 Google Earth reveals the truth: a massive industrial facility. Note the huge latrine pit in the top left (and compare it in size to the semi trucks in the bottom right). We went on a radio show in Sonoma County (home of the Whole Foods farm) expecting hostility... but instead got incredible support. The Press Democrat of Santa Rosa, the paper local to the farm, also gave us surprisingly good front-page treatment. What exactly is going on? One way to explain it is that press in farm country has less of an interest in defending Whole Foods. The company makes its money in the urban metropolises of the world -- not rural, farm country -- and it spends most of its advertising dollars there, too. That may affect coverage in urban areas. James McWilliams recently took the New York Times to task, for example, for its biased coverage of our investigation. (I'll give my take on that blowup in a future blog post.) One can't help but wonder: How much is the Times's coverage being influenced by Whole Foods's just-announced $20 million advertising campaign? There are two lessons to be taken from this. First, don't underestimate farm country. Those who are direct witnesses to the horrendous violence (including environmental violence) done by industrial agriculture are often the first to decry corporate lies. Second, concern over abuse of animals truly is everywhere. Steve Jaxon was as concerned with violence against animals (you hear him audibly gasp a few times as I'm describing what's happening to animals) as he was with corporate fraud. And he is channeling exactly what his listeners feel. Indeed, that is his job. And his reaction to our investigation should give us hope for the world.